Inspired by cool autumn weather and fresh ingredients from my backyard garden and local farm share; this nourishing soup is sure to satisfy you and yours with warm glowing energy. 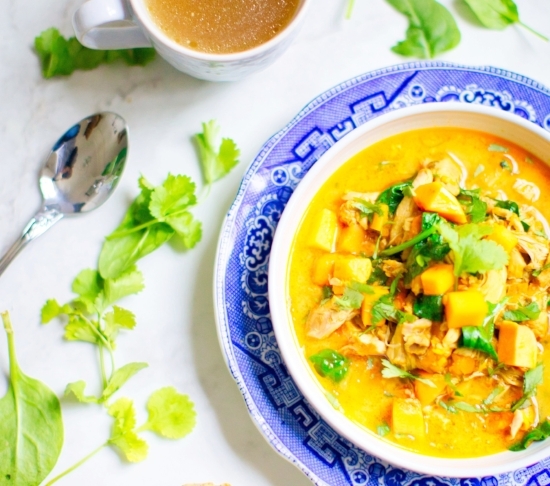 Think of this soup as kindling to energize your mind, body and spirit. 2 chicken thighs oven baked. Place them in a cast iron skillet. Season with paprika, salt, thyme and oregano. Spray with avocado oil. Bake about 30 minutes at 350 degrees until internal temp is 165 degrees. 1 tsp ground turmeric. If you can get fresh turmeric root, by all means go fresh. ½ cup diced celery or bell peppers. I used orange bell peppers. 1 heaping Tbsp finely chopped jalapeno. Leave out the seeds unless you want it fiery hot. While chicken is baking according to directions above, rinse the rice and cook in 1 cup water/according to package directions. When rice is about ½ cooked, add adobo chile powder, carrots and tomato. When all liquid is absorbed, remove from heat, fluff with fork, leave lid on until serving soup. In a soup pot heat 2 Tbsp avocado oil over medium high heat. Add chopped onion and saute for a few minutes. Add carrot and celery or peppers and turmeric. Season gently with salt and pepper. Stir until combined. Add jalapeno and potato. Season with oregano and thyme. Stir to combine. Add chicken bone broth and bay leaf. Bring to gentle boil and immediately reduce to simmer. Cover and let simmer 20 minutes. Cut chicken in bite size pieces or shred with a fork. Add to soup pot and simmer another 10 minutes. Put 3 Tbsp hot rice in the bottom of each soup bowl. Ladle soup over top, sprinkle with kale or cilantro and serve immediately. Keep yourself and family warm this season with more fresh lively food recipes. Foods with a healthful balance and diversity of real food ingredients ward off sugar cravings and keep energy and mood happy for hours. Tam’s title: A Fresh Wellness Mindset is an empowering guide to restore and protect your vital energy plus it has 19 all American easy delicious and satisfying recipes for breakfast, lunch, dinner and snacks. It’s not about a diet. It is a guide to self-discovery that leads readers to a food life that works for them.